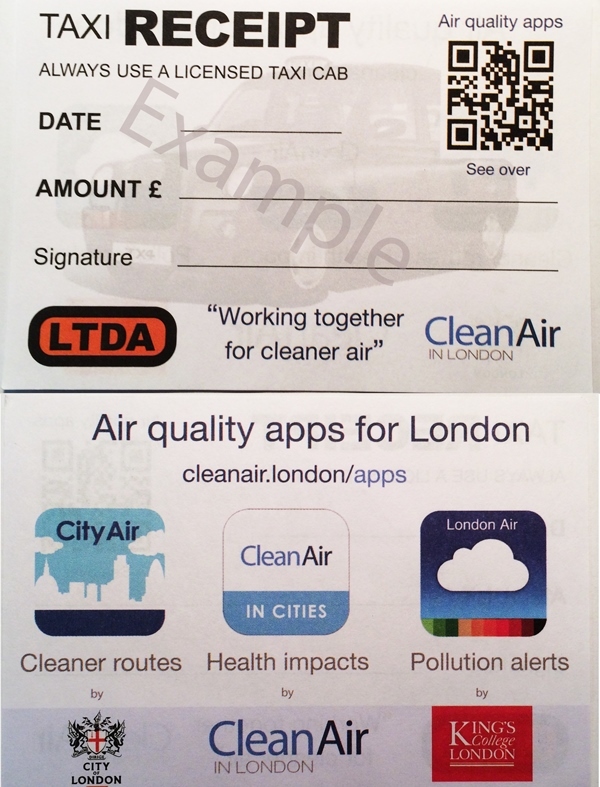 The Licenced Taxi Drivers Association (LTDA) has agreed to support Clean Air in London’s (CAL’s) campaign to build public understanding of air pollution. In order to maximise the impact of this collaboration and in recognition of the LTDA’s unique reach in London, CAL has invited the LTDA to commit resources to this campaign broadly equivalent to sponsorship monies rather than paying CAL. The LTDA has been pleased to agree this approach. – other initiatives from time to time. CAL writing two articles a year for ‘Taxi’ the official publication of the LTDA. In order to maintain CAL’s independence, the LTDA has agreed that CAL may continue to comment on any matter ‘without fear or favour’. In recognition of the above, the LTDA is becoming CAL’s first Bronze Sponsor. “London taxis are at the heart of our great city providing a vital service to many people. “While everyone in London has seen a taxi there is little or no understanding outside the taxi trade of the challenges taxi drivers face. Just one example is that drivers may only purchase a vehicle that meets the Conditions of Fitness (CoF) determined by the Public Carriage Office that is part of Transport for London Chaired by the Mayor of London. Currently only two diesel taxis meet the demanding CoF including the disability access requirement. In other words, the Mayor decides what drivers drive, not drivers. “Clean Air in London is excited by this collaboration and the opportunity to build public understanding of the dangers of air pollution with advice for people on protecting themselves and reducing pollution for themselves and others. A key objective of the campaign will be to provide information so people can sign up to free apps offering smog warnings that should save lives and reduce hospitalisations and build public understanding of air pollution. “Almost exactly 60 years after the first Clean Air Act was introduced for the City of London there is an amazing opportunity to ensure London leads the world again in tackling air pollution. There are 24,000 taxi drivers in London; the LTDA is the biggest representative group in the trade with over 10,000 members. Clean Air in London’s Mission is to achieve urgently and sustainably full compliance with WHO guidelines for air quality throughout London and elsewhere. It works closely with other campaign groups and a wider network of supporters and volunteers to identify and build understanding of the most important issues and encourage decisive action on them. Clean Air in London’s immediate priority is to see that air quality laws are enforced rigorously in London in 2014 (and thereafter). Clean Air in London believes that if we comply fully with relevant laws Britain can show the world how to tackle successfully air quality, climate change and sustainability issues. Clean Air in London is a not-for-profit organisation funded by donations, sponsors and other supporters. It is not a charity in part because a registered charity is not allowed to have political objectives or take part in political lobbying (other than in a generally educational sense). Clean Air in London may wish to participate in such activities. Mayor Johnson recently stated that road transport is responsible for around 80% of airborne pollution in the parts of central London where air pollution is worst, with black cabs contributing 30% of particulate matter emissions in those areas. The City Air app helps you find the healthiest way around London. Are you a jogger, cyclist, driver or commuter? Do you know when pollution is high or low? The City Air app will alert you on days when pollution is forecast to be high and give you tailored advice on simple actions you can take to reduce your emissions and exposure to air pollution. Use the map to plan your journey and easily pick the lowest pollution route through the City – even in 3D! The London Air Quality Network provides information about air pollution in London and related matters. Several mobile versions are available. The Clean Air in Cities app reports the health impact of long-term exposure to dangerous airborne particles (PM2.5) for the population in local areas, regions and England as a whole. The App estimates the number of deaths attributable to air pollution on a pro rata, calendar year-to-date, basis and the time to the next attributable death as well as displaying the percentage of total deaths attributable to air pollution. It does not estimate or display the number of actual deaths from air pollution or the risk for an individual. Users can also see estimates for total population-weighted exposure to annual average concentrations of PM2.5 in different local areas and/or regions relative to World Health Organisation guidelines and England as a whole. City of London (Various Powers) Act received Royal Assent on 5 July 1954.